Hartenberg Estate was a relatively new name to me when I tasted through their range in London earlier this year, courtesy of Hartenberg’s new UK importer,Bancroft Wines, who have been bringing their wines into the UK since January 2009. Owned by the Mackenzie family, the current incarnation of the Hartenberg label has existed only since 1985, though in fact this estate has been a wine growing farm since 1692, and has been in continuous grape production since then. The Hartenberg estate lies in its own, self-contained valley in Stellenbosch, in the Bottelary hills, with a natural water source flowing through the property into a wetland system. This wetland occupies 65 of the farm’s 170 hectares, and has never been cultivated. Winemaking practices seek to protect the wetland and there is an active conservation programme in place that involves both water management, the clearing of alien vegetation and the planting of cover crops between vine rows as a natural habitat for fauna. Today, the estate is run by the daughters of Ken Mackenzie (a Bermuda-based businessman who bought the farm in 1986) along with winemaker Carl Schultz. A programme of investment has focused on replanting specific sites covering 55 hectares with premium grape varieties. Weather stations automatically monitor conditions, leading to a 50% reduction in the use of chemical sprays. Only French oak barrels are used in the cellar. 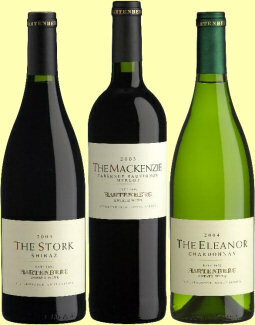 The profile of this estate has certainly been on the up as one the highest quality in South Africa, with five stars from John Platter for their top, Bordeaux-blend ‘The Mackenzie’, the trophy for ‘Most Successful Producer’ at the South African Airways Awards 2008 and the estate Merlot picking up the varietal Trophy at the International Wine and Spirit Competition. This is an impressive range of wines with modest prices for the quality on offer, and I have to say the top reds are amongst the best from South Africa in my experience. See all stockists on wine-searcher.com.